Janet Ulph has given a helpful overview of the seizure by UK Customs of this funerary statue. The statue was seized after Her Majesty’s Revenue and Customs said the statue was “misdeclared”. It was declared as a statue from Turkey, with an estimated value of $110,000. Yet HMRC alleged the statue originated from Cyrene, Libya and its value was closer to £1.5m. An object can be forfeited under the Customs and Excise Management Act 1979 (CEMA) if there is a misdeclaration in a material particular which has been made knowingly or recklessly. Consequently, the extensive discussion by the experts regarding the value and the source of origin was relevant. But it can be argued that the question of legal title was the key issue. Firstly, the applicant Mr. Al Qassas was required to swear that he believed that he was the owner at the time of the seizure (in accordance with CEMA, Schedule 3) and he failed to do this (see thejudgment at paragraph 78). Secondly, regardless of the nature of the goods, any forfeiture must be proportionate in order to satisfy Article 1 of the First Protocol of the European Convention on Human Rights (as implemented into UK law by the Human Rights Act 1998). The judgment acknowledges this issue at paragraphs 30, 74 and 81. It was HMRC’s case that Mr. Al Qasssas did not own the statue because it had been looted from a UNESCO World Heritage site in Libya; if this was accepted, it could not be said to be disproportionate to confiscate the property and return it to the true owner. In some respects, the judgment is unsatisfying. There is no mention of the 1970 UNESCO Convention and no stirring words, as in the Court of Appeal’s judgment in Government of the Islamic Republic of Iran v The Barakat Galleries Ltd, of “the international acceptance of the desirability of protection of the national heritage.” Instead, what appears to have been pivotal is that Mr. Al Qassas and his witnesses did not appear to give evidence and to make themselves available for cross-examination. As a result, there was insufficient evidence to challenge HMRC’s argument that the State of Libya owned the statue. The seizure and eventual repatriation of the looted statue is heartening. It demonstrates that enforcement authorities, such as Customs, can play a significant role in combating the illicit trade in cultural property. However, the case also demonstrates how much these authorities depend upon assistance from enforcement agents overseas, experts in museums, and others. The case shares some similarities with Michael Steinhardt’s Gold Phiale case, which was seized by U.S. Customs agents after a similar discrepancy emerged in relation to the origin and value stated on customs declarations. The decision is available from IAL here. Of particular interest is paragraph 52 of the decision, which references testimony given by John Paul Labbat, a U.S. Federal Agent who noted that Hassan Fazeli Trading, which claimed to have been owner of the statue since 1977, had had objects forfeited in the United States in 2008 and 2010. Agency, Ancient Greek relic looted from Libya to be returned, 9–1, 2015, http://www.telegraph.co.uk/news/earth/environment/archaeology/11837886/Ancient-Greek-relic-looted-from-Libya-to-be-returned.html . 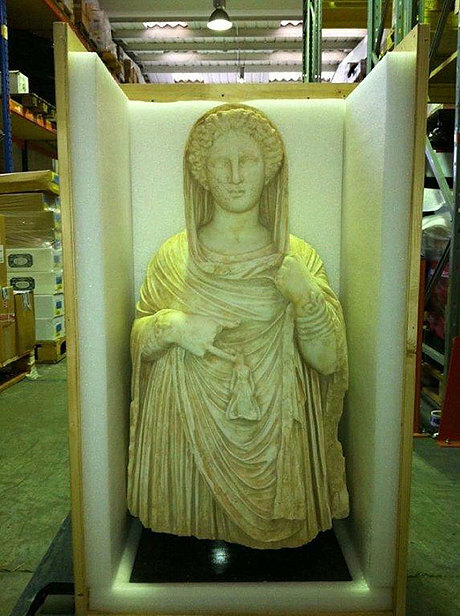 UK Customs seizure of looted Libyan statue | Institute of Art and Law Blog, http://www.ial.uk.com/news/uk-customs-seizure-of-looted-libyan-statue/ .